This is an original and not a copy. It is a rarity as well. 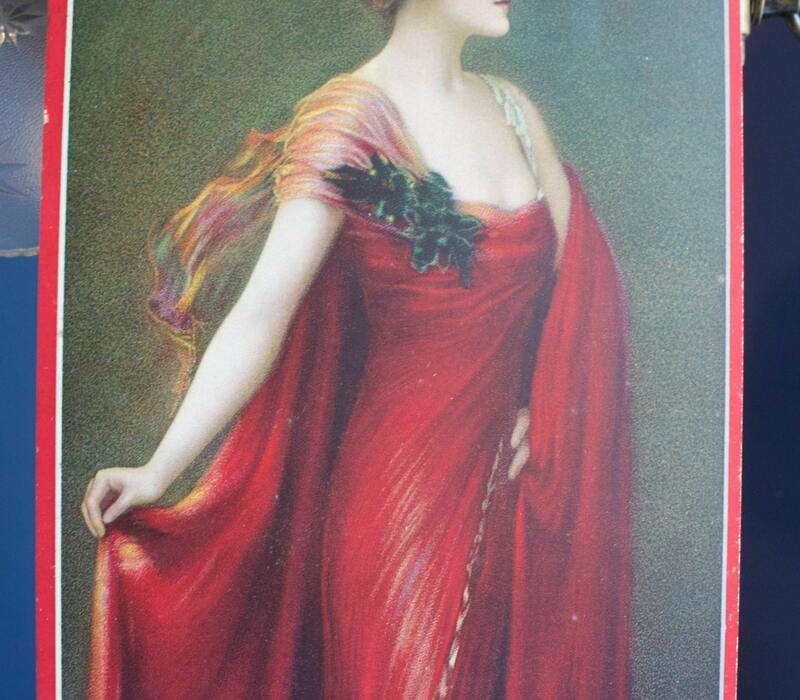 This antique, 1913 chromolithograph advertisement for W.B. 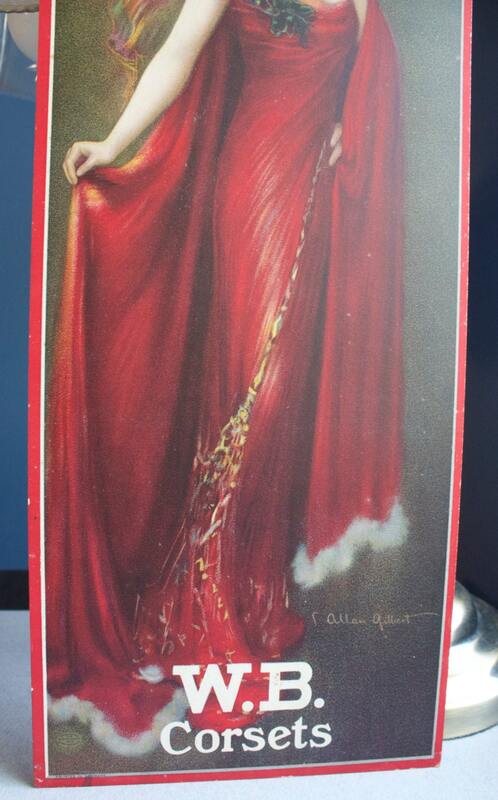 Corsets was created by Charles Allan Gilbert or C. Allan Gilbert as he was sometimes known. Gilbert, who was born in 1873, began studying art with a portrait painter in New England. He studied for a time in France and returned after one year. He illustrated many books as well as magazines, posters, and calendars. He was also an animator and camouflage artist during WWI. This advertisement is 20 x 7.5 and printed on cardboard. The back has residue from the piece being stuck to another piece of cardboard. When I removed the piece from the frame, the other piece of cardboard came loose from the back of the chromolithograph. Incidentally, I am not selling the frame with the piece as it is a cheap modern one that does not do justice to the beauty of this rare advertisement. It looks as if this advertisement were the cover for a calendar as evidenced by the two holes at the top. Please examine the photographs and don't hesitate to ask for more. There are some condition issues along the edges at the top and along the sides as well as along the bottom. 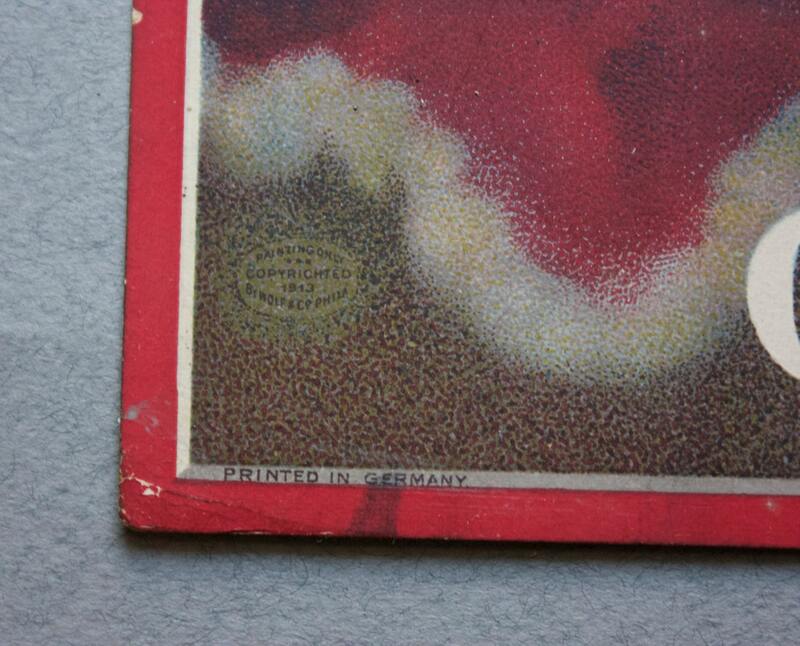 One condition issue on the actual background of the lithograph appears at the top between the two holes in the form of a crease. There are also faint spots on some areas, probably owing to its time in the frame as it wasn't framed properly to protect it. Finally, the "B" in the "W.B." has some spotting on it. The lower right side has the artist's signature (C Allan Gilbert). 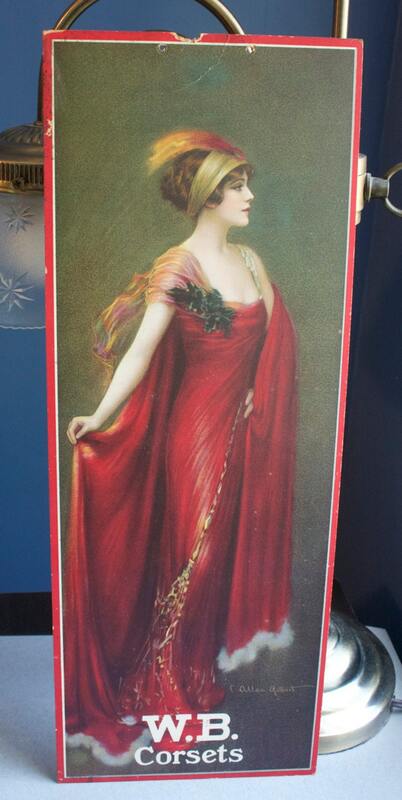 The lower left side has an oval with "Painting Only Copyrighted 1913 by Wolf & Co Phila." Thank you to www.metropostcard.com for the following information on Wolf & Co: This firm was founded by the brothers Edward, Isaac, and Gustave Wolf in 1879. They became leading importer, publisher, and manufacturer of art novelties in the United States. 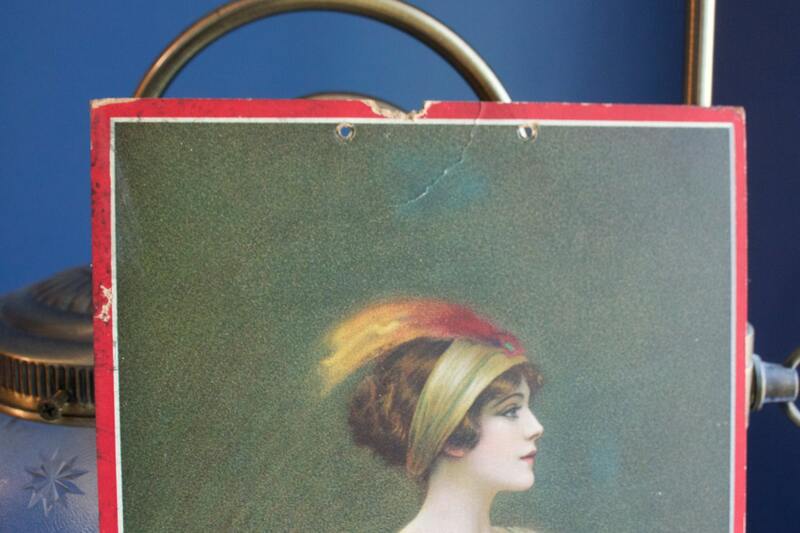 They were also well known for their advertising work in chromolithography as well as fancy embossing. They eventually established a branch in Berlin to do much of their lithographic printing. They became a large publisher of holiday and greeting cards, but in 1895 they and the Art Lithographic Publishing Co. founded the International Art Publishing Co. as a subsidiary to take over their postcard and souvenir production. Edward Wolf and Isaac Wolf, Jr. would remain Directors of the Philadelphia firm. Ellen H. Clapsaddle, who had been contributing work to their subsidiary, was hired by Wolf & Co. in 1906 as a full time illustrator. The lower left hand corner has "Printed in Germany." **The lamp against which the chromolithograph rests is not for sale. Lastly, once again, please do ask for more specific photographs if need be as I want the potential buyer to see everything they need to see before making this purchase.